Deep Purple wash n wax shampoo is a true wash n wax soap. 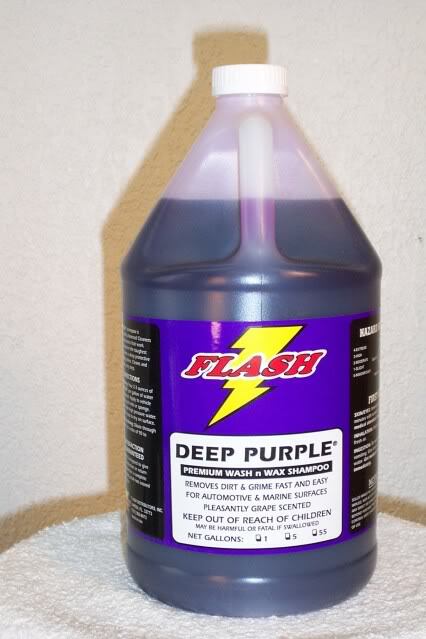 Deep Purple will clean road dirt, grease, oil and grime from all automotive and marine surfaces. This product is very concentrated and can be diluted in a wash bucket at a dilution ratio of 90-120:1. Deep Purple works great in hard water environments and leaves no water spots.Your car will have that just waxed look by using Deep Purple wash n wax shampoo. Grape Gloss spray wax is specially formulated to be used as a quick detailer on a wet or dry car. Most spray detailers are made with propolyene glycol which acts as a gloss enhancer, but only lasts for a few days and does not protect your finish. Grape Gloss contains a special polymer wax that cleans, shines and protects. It can be used on chrome, stainless, Glass, painted surfaces, plastic & wood surfaces. Grape Gloss will bead for up to 30 days on a black car in the Florida sun. It can be used on a dry dusty or dirty car and will not leave swirly scratches. You can also spray Grape Gloss spray wax on an unwaxed car (good finish) and feel the difference of a smooth/slick waxed finish. 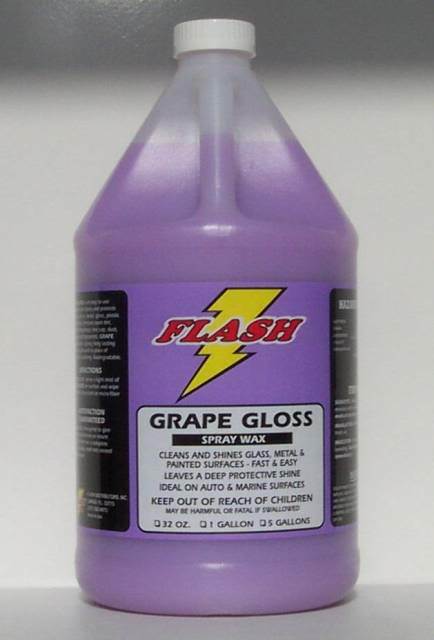 Grape Gloss is easy to use and will not leave wax residue on plastic surfaces or body moldings. It can also be used on your winshield and the water will bead off resulting in minimal use of your wipers. A light mist goes a long way. Apply Deep Purple to the whole vehicle using a sponge or wash mitt. If it dries on the car and streaks. Do not be alarmed, it will rinse free. Rinse the vehicle with high pressure water (hose or pressure washer). Watch the water bead/break and begin to dry on the surface. After rinsing with water, apply Grape Gloss spray wax to the whole vehicle. Do sections at a time applying a light mist and wiping with a chamois or microfiber towel. Grape Gloss will add more wax to the vehicle and will help dry the water at the same time.Grape Gloss will also remove water spots.Many of our customers say that by using this system there is no need to hand wax thier cars. They wax just once or twice a year. And no messy clean up with wax residue in moldings trim etc. 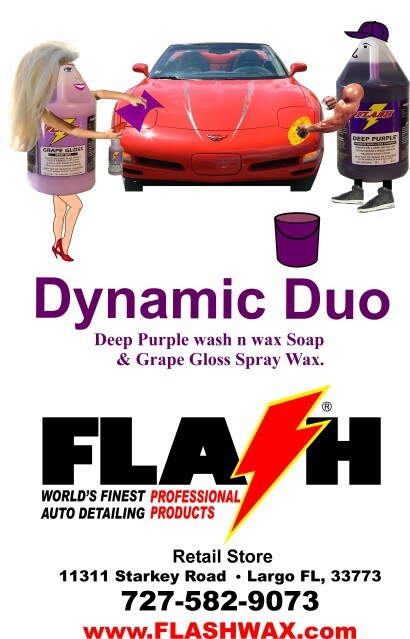 Deep Purple wash n wax shampoo and Grape Gloss Spray wax are easy to use and can be used in direct sunlight. I would like to tell you a little story of how I experienced the effectiveness of these two products. A few years ago my wife and I drove to New York to visit our family for Christmas. Our Suv was filthy from the trip. The temp was 35 degrees, snow, rain.I wanted to test our products in a cold weather environment. It was warm enough for me to wash our vehicle. I washed it with Deep Purple wash n wax and sprayed the whole vehicle with Grape Gloss spray wax.We drove around all day Christmas shopping. Raining, snow, slush etc. A mess. I checked the vehicle the next day after it was dry. I was amazed to see that no dirt film stuck to our vehicle. The paint and glass was clean like I just washed it. The wheels too! The Deep Purple and Grape Gloss kept the dirt from sticking to the vehicle! These products are also great for removing road salt for those of you that live in harsh winter environments. This test proved to me that these products are so powerful and durable enough to withstand any climate. I'm glad you posted these videos Joe. I've told people that these products allow will give you water beading and some have been quite skeptical. Now I have video proof. Most people dont believe it because they were scammed many times before from various chemical companies. The promise to do and not deliver results has been something that has hurt consumers for many years. I can understand why so many people are skeptical when it comes to a product. Big Companies with big words and big bull. It aggravates me to see how they do business. These companies usually do not get repeat business from the same consumer. Burn me once and I wont buy from you again. We do not do that. Every product that we manufacture will promise to do the job, and deliver more than what a consumer expects. This is the honest way we do business and it will never change. This is why we have repeat customers. We are starting a big promotion of these two products. I am also having T-shirts made up to help promote this easy to use and very effective paint protection system. Thanks for your support. I am getting streaking on my black ridge line. Not sure if its the humidity causing it. I was wondering should I cut down grape gloss like 1:2 to see if that helps reduce the streaking. Thanks. Grape Gloss can be used as a waterless car wash and saves constant car washing. I have never had Grape Gloss scratch surfaces or leave spider scratches or swirls in any of my black cars. Grape Gloss is applied with a light mist and wipe. Although if you have sand grit on your car, then I would suggest using a heavy dose of Grape Gloss in those areas, before wiping with a soft microfiber towel. Using Grape Gloss with a microfiber towel is the key to waterless car washing. Grape Gloss will not leave a powdery wax residue on moldings, plastic bumpers, mirrors etc. Grape Gloss cleans dirt, grease, tree sap and light water spots from painted surfaces, glass, chrome, plastic, aluminum and stainless steel. Grape Gloss has a polymer wax that will protect surfaces from spotting and contaminates. It will also leave a slick feel on the surface and a water beading shine. Grape Gloss also works great on your winsheild. Minimal use of your wipers. You can dilute Grape Gloss spray wax at a dilution of 1:3. At this ratio you can use it on a hot car in the sun without streaking. It will sometimes streak on a waxed black car in the sun. The reason for this is that Grape Gloss is such a concentrated spray wax and the vehicle is also hand waxed. If you dilute Grape Gloss with water, you dilute the wax concentration. Therefore, it can be used on a freshly waxed hot car in the sun. Grape Gloss full strength will not streak on an unwaxed car in direct sunlight. But, you also need to remember is that if you dilute Grape Gloss, you also lose some wax protection. You can also use Grape Gloss in your washer fluid reservoir. If it is a one gallon container, add 16 oz of Grape Gloss to water. The water will break and bead on the winsheild and stop wipers from skipping on the glass. Thanks. You might try changing out to a different brand of microfiber towel. I've had Grape Gloss streak when using lesser quality microfibers, but switching to a better quality one alleviated the problem. I had just cleaned my windows on my car a few days ago with Grape Gloss. Today there was a really bad thunder storm on my way to work. I happened to notice how the water was sheeting off the windshield cause of the wax in the grape gloss. . I didn't need to use my wipers at all. Grape Gloss kept the water rolling right off. Heres a sneak preview of a new T-shirt we are creating. We need to make a few changes, so it is not finished yet. Used Grape Gloss on one of the company vehicles. The vehicles are blue on the top and white on bottom. I used the Grape Gloss on the oxidized blue paint just see what it would do. It actually took the oxidation away and left a nice shine to the blue paint. I didn't think that anything would happen cause there aren't any cleaners in the spray but looks way better. Grape Gloss is made for a good finish. It will remove oxidation, because of the cleaning agents and polymer wax. Grape Gloss is very powerful for a quick detailer spray wax. Thanks for testing the product. Nothing but rain here most of today. All the work that I did on the company van nothing but rain spots all over it. Broke out the good old Grap Gloss and microfiber. Went to work. In 10 minutes an nice shiny van again. I can't wait to see the surprised look from the gent that drives it all the time. Grape Gloss got rid of those water spots from the rain with ease. Again an outstanding product. I was using the product cut 1:1 and still had great results with it. I had a gent a work that owns a 2009 Z06 Vette. He's been on me about using Adam's quick detailer. I told him about Grape Gloss. He was like everyone that owns a vette only uses adam's detailer. I was like I'll give you my bottle of grape gloss to try. He did half the hood with adams the other half with grape gloss. Someone called him on the phone which cause him to lost his train of thought. He then stated that he couldn't tell which side was which product. They both looked great with plenty of shine and depth of color to him. I told why spend all that money for adams when you can a gallon of grape gloss and have the same great look. Hopefully another convert to your product line. Thanks again for the great products. I was never very fond of Adams detailer. Although it works well, it smells like cherry cough medicine. Cherry fragrance is very strong. They put too much fragrance oil in the formula. There is a chemical company in California that manufactures Adams products. We put our name on the products that we manufacture. If we dont make it, our name does not go on the product. There are many companies that private label products. Grape Gloss spray wax detailer works just as well as adams and is a lot less expensive. We use a different type of wax in our formula. They only way to tell the difference is the longevity. Many Corvette owners use Grape Gloss on their vettes and are very happy with the results. But, then again there are some people that think if a product is too cheap. Then it must be junk. That is very popular attitude within the Corvette world. In some instances that can be true. But not with our products. I tried to tell them this but they dont believe me. They think that I am trying to scam them. I can understand this. It takes another consumer that uses the products to show them the difference. You are not affiliated with the company and are not trying to sell it to them. Therefore they will believe you than me. That is why we receive most of our business thru referrals. Thanks for the referral and demonstrating our products. I guess only time will tell as to whether he changes product line or not. I share your opinion on Adam's products. They have some very good products, but they're just re-packaged and marked up Chemical Guy's products. Same goes a vast majority of the Poorboy's line minus some of the markup. Also, I have yet to find any quick detailers that beat Grape Gloss. Surf City's Speed Demon comes real close, but it's also significantly more expensive. I can buy a gallon of Grape Gloss for only a few bucks more than what a 24oz bottle of Speed Demon costs. In short, you're probably not going to find a superior quick detailer without spending alot more money. I have a question about deep purple wash and wax. If a vehicle has poly sealant or wax applied to it will deep purple strip off the sealant/wax or will it enhance the shine of the applied product.. Thanks. Good question. Deep Purple will not strip wax. Deep Purple wash N wax shampoo is PH balanced and contains a wax agent. It will enhance a waxed or unwaxed surface. I bought some Optimum No Rinse to try. I read that you make a quick detailer out of by adding 8ozs. to 1 gallon of water. Any way I made a gallon up. I decided to give it a try. To my surprise after hearing all the praise about ONR leaving a slick surface I gave it a try and was sadly disappointed. It doesn't leave that slick as glass feeling that I get after I have used grape gloss on a painted surface. I am going to just stick with a proven product. Even when cut 1:1 grape gloss still leaves a incredible slick and shiny surface behind. Joe any chance off adding anti-static properties to Grape Gloss in the future?? Anyway still the champ in my book. » How Deep Do I Dig When Panning?